Getting out in the Smokies is an opportunity that is not to be missed. This past weekend's trip was special, a trip into the backcountry. As much as I love backpacking, I don't do it often enough. However, there is one aspect of backpacking that I really don't enjoy: going in the rain. With the forecast practically guaranteeing a downpour, I opted to stay away from the overnight portion of my trip. The messy forecast actually had me excited about the fishing though. Hatching insects and nasty weather tend to go hand in hand. I was supposed to fish with a new fishing buddy and he was not afraid of the forecast so the trip was still a go for Sunday. The anticipation was building to the point where it was hard for me to go to sleep. When it is after 11:00 p.m. and the alarm is set for 4:00 a.m., the logical side of my brain insists that I fall asleep. As soon as your brain insists, the body rebels and the vicious cycle spirals out of control. Sometime close to midnight I finally drifted off. The alarm woke me up rudely. As I moved around the house, my brain began to clear and the excitement returned. Arriving in the Park, we opted to head up Little River trail. Our original plan was to hike a ways up but with the bad weather we knew that the stream would probably be ours for the day. Accordingly we started fishing without going too far. 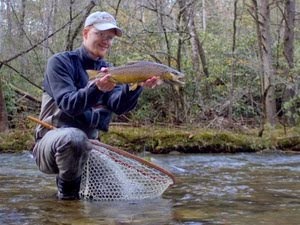 Breck wanted to try some new techniques, especially fishing nymphs using the "high stick" style so common in the southern Appalachians. I rigged up with a double nymph rig and set him up with a single bead head Tellico. 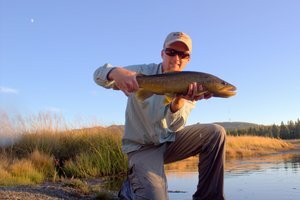 During my quick demonstration of the technique I landed two nice rainbows and we were off and running. He quickly hooked and landed his first rainbow with the new technique and then we worked up the stream, taking turns at likely spots. As the rain continued to come and go, the insects became more and more active. 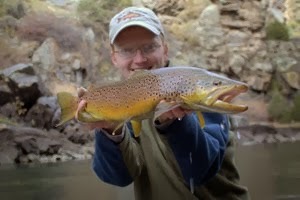 Finally we couldn't stand it any longer and tied on the dry flies. After a couple of fish, it was obvious that while we could catch a few on top, the primary method for the day was nymph fishing. Later, after Breck had to leave in the early afternoon, I tried some new spots out. The plan worked out perfectly. 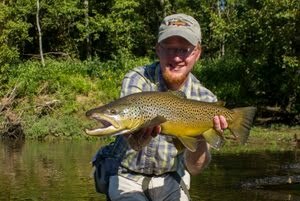 Numerous mayflies and stoneflies were hatching and after picking up some really nice rainbows and missing a couple of larger browns on nymphs, I switched over to dries. This was the perfect way to end the day. 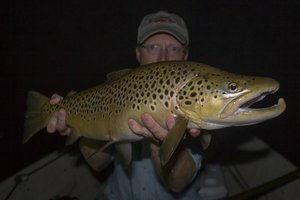 I caught a couple of browns on top and finally the previous late night and early morning caught up to me. With daylight still left I opted to head on home before I fell asleep on my feet. Thankfully, I managed to stay awake long enough to stop and spend a little time with my mom for Mother's Day. When I finally fell asleep it was the sleep of exhaustion from a day well spent. This weekend, I'm hoping to head for the backcountry of the Smoky Mountains. Unfortunately I can only get away for one night, but of course that is better than none. I've been tying a little, but not enough. Then again, I don't remember any trip I've ever been on where I had tied "enough" flies before leaving. There is always the feeling that I should have tied more or maybe tied with more variety. There is just one fly in the ointment. My throat is a little scratchy, nothing serious mind you, but just enough to cause mild concern. Must...not....get....sick. Opportunities to backpack don't come often enough by any means so I'm really hoping I get to go. Out for a walk Saturday evening, I watched as a beautiful sunset gave way to a beautiful moonrise.